What is High Lift and Low Lift Grouting? High Lift and Low Lift grouting are terms used in building codes to define the method of placing grout in reinforced masonry walls. Codes allow the contractor to choose either method unless the structural engineer requires one or the other. Low Lift grouting may or may not require the use of inspection or clean-out openings. High Lift grouting will require inspection openings spaced no more than 32 inches apart or at each rebar location. 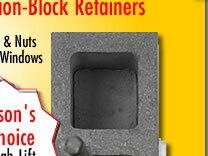 Does The Smart Masonry Clean-Out System require precision block openings or cell widths? No. 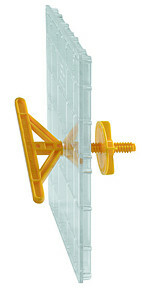 Smart "T-Bolts" are designed to wedge against the inner shell face of a block opening from 1 inch to 4-1/2 inches wide. The Smart "T-Bolt" can be rotated any degree to accommodate a narrower shell width. 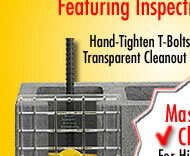 We recommend that you order inspection block from your block manufacturer or saw cut your inspection openings. Hammer cutting block is not recommended since it produces block fatigue, produces excessive debris and wastes block units. Do you need special tools for the Smart Masonry Clean-Out System? No. The Smart "Nut" is designed to be hand tightened. What if the specifications restrict grouting to the low lift method? Many engineers feel that the use of plywood and other non-transparent covers can lead to unfilled or unconsolidated grout cells. Submit the Smart Masonry Clean-Out System to the Engineer and chances are you will be able to switch to High Lift grouting. What about Tooled finished walls? Many contractors hide the clean-out opening behind bottom of wall base boards. Building codes allow a minimum clean-out opening of 3 inches by 3 inches. It takes a few seconds! Pre-assemble the Smart Masonry Clean-Out System as shown in this picture. Hold the threaded end of the "T-Bolt" with one hand. Insert the "T" part of the "T-Bolt" vertically through the clean-out opening of the block. Hand tighten the "Nut" with your other hand and the Smart Masonry Clean-Out System is now installed. $ave money on Labor. Studies show a 25-30% increase in productivity when High Lift grouting is used instead of low lift grouting. This eliminates 2' to 4' lap bars that create obstacles for masons and reduces their productivity. Less lifting over rebar reduces a masons fatigue and allows for increased productivity. $ave money on Rebar. Fewer lap bars required. $ave money on grout pumping. Fewer grout pours equals fewer pumping cycles. $ave money on grout. Fewer grout pours result in less overall grout waste. Causes no damage to the face of the block and requires no patching of block as with the plywood/nailing method of forming clean-out covers. Eliminates costly blow-outs that require chiseling and grinding. Adds to your professional image. The Smart Masonry Clean-Out System, when installed, demonstrates the professionalism expected by engineers, architects, general contractors and especially inspectors. Plywood and hammer cut inspection holes lead to excessive waste and cleanup. Advanced Placement - allows for inspection through the transparent "Window" and readiness to pour immediately after inspection. No need for hammers, nails, plywood and bruised thumbs. Quick Installation - can be installed and removed in seconds, vastly reducing labor costs. 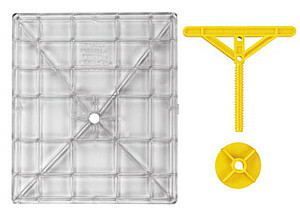 Corrosion Resistant - made from strong ABS plastic instead of metal, removing concern for corrosion of exposed fasteners. Manufactured by Smart Masonry Systems, Inc.
© 2019 Smart Masonry Systems, Inc.